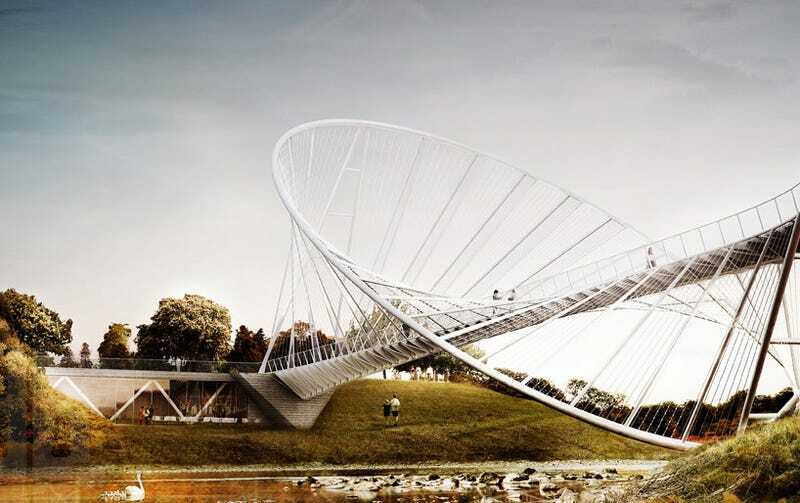 Until then, though, a trickle of interesting submissions has been popping up on designboom, including the—sadly—non-winning proposal seen here: an "elliptical bridge" designed and rendered by Penda. Penda's (largely unbuilt) work is typified by a graceful use of repetitive geometric elements and lots and lots of curves—there's quite a bit of Bjarke Ingels' influence kicking around in there, but their work also shows an impressive and exciting attention to detail at a variety of scales, from exploring how small, triangular units can fit together to form benches to massive and towering sprays of bamboo. Their "Cola Bow," an arch made from 17,000 repurposed soda bottles, is a particularly smart repetition of a basic element—the plastic bottle—to form a colorful and swooping outdoor roof, almost an aboveground tunnel for the city. Although there is apparently no chance at all that this will actually be built in Salford any time soon, here is at least one vote for someone to build this thing elsewhere—and an enthusiastic call to see hypothetical suspension bridge designs continue to play with unexpected sources of stability, include rings, knots, bows, and arches, mathematical models disguised as urban infrastructure and pinned down across rivers and parks like rare butterflies. All images courtesy of Penda via designboom.